Powers/Abilities: The sasquatch race possessed a minimum of enhanced human level of strength that seemed to increase when they went berserk (at least for the males). They displayed enhanced human levels of stamina, speed and durability plus strong stealth and hunting skills. When in combat, sasquatches have shown to fight with a great bestial fury with increasing strength. Traits: Existing for centuries, sasquatches stood about 12'-15' tall and possessed a decreased mental capacity but had strong animal instincts and were able to instinctively travel across land to find their home. Sasquatches were omnivores and had extended incisors, notably from the lower jaw, and varied in color (mostly orange, brown and white) with their shaggy coats and kept mostly to themselves. They were also protective of their young and remained hidden as much as possible for their own survival. (Alpha Flight II#6 (fb) - BTS) - Department H received a mandate to round up the former members of Alpha Flight to form a new team. The former team member, Walter Langkowski (codenamed Sasquatch) was at the South Pole but a sighting of a real sasquatch in the Canadian wild alerted Department H and one of its dominant male members was captured and taken to Department H Headquarters. (Alpha Flight II#1-5) - Usually restrained when not in the field, the animal known as Sasquatch engaged in various missions alongside Alpha Flight with its bestial nature often controlled by Murmur. 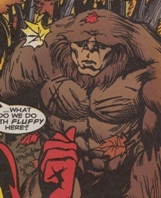 (Alpha Flight II#6) - Sasquatch escaped and Puck was assigned to find him. The animal made its way west from Department H Headquarters to where its tribe was. 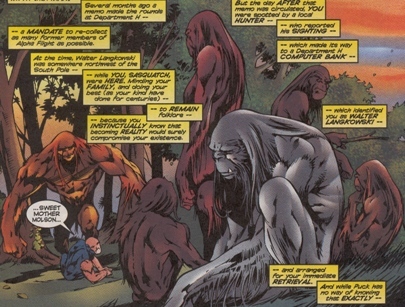 Finding Puck spying on its family, Sasquatch threw him about and considered Puck to be a threat to the sasquatch's family. Department H's Epsilon soldiers then appeared and recaptured the beast, dragging it away once more from its family while General Clarke stared down the remaining but hidden sasquatches. (Alpha Flight II#7-12/ Uncanny X-Men I#355) - The recaptured Sasquatch was again involved in Alpha Flight missions but was ultimately killed during a battle with the Zodiac. (Generation X#58 (fb) - BTS) - A top secret (US?) military detachment captured a live Canadian sasquatch and were taking it to Boston to examine it and run some tests. However, the truck transporting the animal was wrecked and the creature escaped but was scared in its new and unrecognizable surroundings. (Generation X#58) - The escaped sasquatch unintentionally attacked a student near the Massachusetts Academy, location of the training school for members of Generation X. Suspecting it to be their feral teammate Penance, the mutant squad (Banshee, Chamber, Emma Frost, Husk, Jubilee, Skin, Synch) went to investigate. They discovered the frightened sasquatch who attacked them but he was beaten back by the savage Penance who suddenly appeared. Overcome and exhausted, the sasquatch fell down and Emma Frost found no human consciousness within the animal. Banshee found a nearby soldier who explained the situation. Banshee later contacted Alpha Flight (Guardian, Puck, Sasquatch (Walter Langkowski) and Snowbird) who picked up the beast and took him back across the border to its home. Comments: Individual created by Steve Seagle (writer), Scott Clarke (pencils) and Chris Carlson (inks). Have there been any other sightings? It would seem that the Alphan Sasquatch was the "alpha male" of its tribe. Profile by Grendel Prime and AvatarWarlord72. Generation X#58, p19, panel 7 (among leaves).